Alma has had a tough time since her grandmother died, but the music of Jovita has helped her get through things. Then, Jovita is gunned down in a drive-by shooting and Alma's life seems to fall apart. She struggles with a family trying to stick together amidst an older brother falling into gang life and an older sister who dumps her own daughter on Alma to take care of. But Alma finds comfort next door at the neighbor's house, where she sneaks over while the neighbor is out and discovers a wide world of music. An oddly amoral story of finding oneself in the midst of the barrio. Things both kind and criminal take place with little acknowledgement of either one. 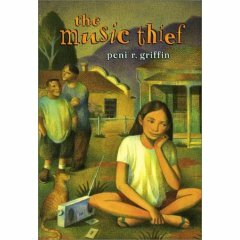 Instead, Griffin keeps the focus tight on this child realizing her own potential and her own failings. Even the ending is left open and ambiguous, as if there was a lot more of a story to tell. I ended up liking this story, but mostly for its originality and vision.